Christina Gee, an associate professor of clinical and community psychology, incorporated alumni visits into her class as part of new courses focused on career development in the Columbian College of Arts and Sciences. Students in the Columbian College of Arts and Sciences can now work on their resumes and get career advice while taking classes in subjects like geography or music. CCAS piloted six courses this academic year focused on career development in subjects ranging from biology and geography to psychology and music. The courses integrate skills like resume writing and networking into class discussions and assignments, which students said will give them a leg up as they pursue careers with a liberal arts degree. CCAS Dean Ben Vinson said the courses were offered to connect classroom learning with professional development skills. After receiving student evaluations from the courses at the end of this semester, he said administrators will review the classes and may change offerings ahead of the fall semester. “In collaboration with GW Career Services, the Columbian College of Arts and Sciences was pleased to introduce to our students this year a handful of courses meant to embody the pedagogy of the ‘engaged liberal arts,’ which we see as connecting scholarship and the theoretical realm with practice-oriented learning enterprises and professional development,” he said in an email. Similar to dean’s seminars and sophomore colloquia, the “engaged liberal arts courses” are small seminar courses only available to sophomores and juniors to help them learn skills and establish a structured career path earlier in college, according to a University release last month. The University has launched several initiatives to boost career services in recent years – like expanding career coaches to the Mount Vernon Campus and establishing a platform to professionally connect students and alumni. The Elliott School of International Affairs will launch a mandatory first-year course focusing on leadership and career skills next fall. Elizabeth Chacko, the CCAS associate dean for undergraduate studies and a professor of geography and international affairs, taught one of the courses – Migrants and the City – this semester, which focuses on immigration flow into cities. Chacko said she worked with career services to incorporate professional development modules into her course, including a career strength assessment test, a resume writing lesson and information about jobs and internships in each student’s specific field. “We felt that students should get professional development support earlier and not wait until senior year to start thinking about jobs and how to position oneself best for a career in a field,” Chacko said. 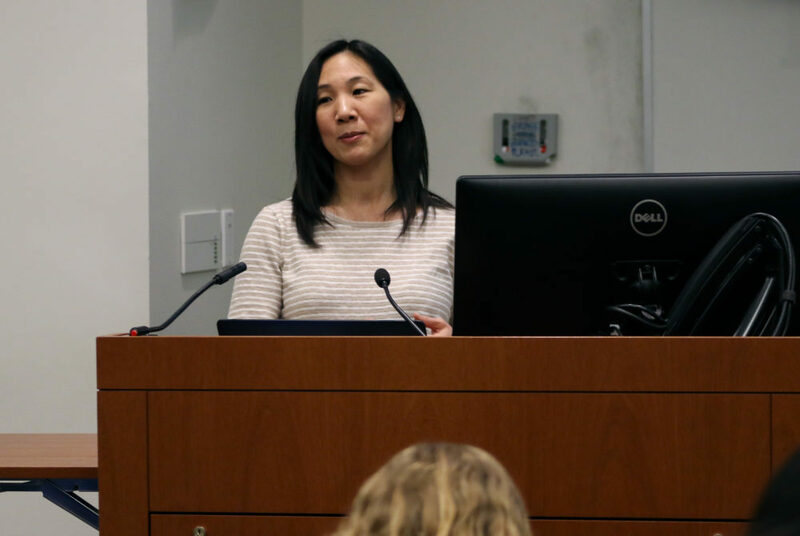 Christina Gee, an associate professor of clinical and community psychology, said her clinical psychology course this semester was the “perfect place” to allow students to learn about careers in the field. She said there was a section in the syllabus stating the course will integrate classroom learning with experiential learning and career development. She said she worked with career services to plan her course and has invited alumni to discuss their work in the psychology field with the class. Earlier this semester, her class also visited the American Psychological Association, an organization that represents psychologists in the United States, where students learned about potential career options. Senior Tyler McManus – who took Gee’s course this semester – said he enjoys the class more than typical courses because it provides “tangible benefits” and opportunities outside of the classroom along with normal coursework. McManus said offering more career-focused courses allows students to spend time building a resume and working closely with a career coach. Sophomore Carley Christerson, who took a Public History course this fall, said students were given opportunities to meet with a former top-level National Security Agency employee and visit places like the National Archives and Office of Historian at the State Department. Students took personality tests to discover how their skill sets would translate in a workplace environment during the course, she said.